YellaWood® KDAT Pressure Treated Plain Boards are perfect where quality 2x lumber is needed for exterior use. The 2x4 size works well under YellaWood® KDAT Handrail (photo at left). The 2x4 size can also be used as Bottom Rail (photo at left), but only if Pressure Treated, PVC, or Polyurethane Balusters are used. 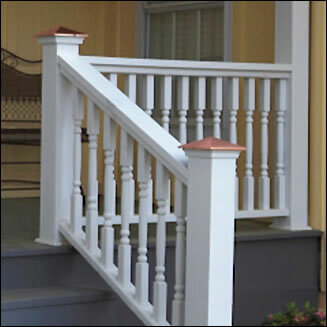 Otherwise, please use Sloped-top Bottom Rail to avoid premature Baluster bottom rot problems. Both 2x4 and 2x6 sizes can also be used as durable, inexpensive plain Handrailing or as good looking YellaWood® Decking. NOTE - 3', 6', and 12' lengths are only available in the 2x6 size.